NATS Holdings Limited (NATS) today announced its results for the year ended 31 March 2014. “We have made strong progress this year. Revenue and operating profit before exceptional items improved and our financial position remains robust. Our profit before tax at £157.5m (2013: £160.8m restated) was £3.3m lower than last year but this result included the cost of a redundancy programme and a goodwill impairment charge. “Our major focus this year has been on consulting extensively with en route customers on our plan for Reference Period 2 (RP2) (2015-2019) for our economically regulated business. We were innovative and ambitious in our approach, presenting a real choice of service offerings and with a clear focus on cost reduction and the economic value from better airspace design, more fuel efficient flight profiles, improved network capacity and minimal delay. After review by the CAA and the DfT, our final plan contains real price reductions of over 21% over the 5 year period exceeding EU-wide targets in all the key performance areas of safety, capacity, environment and cost efficiency. NATS provides air traffic control services through two main operating subsidiaries: NATS (En Route) plc, which is economically regulated by the Civil Aviation Authority, reported a profit before tax of £133.9m (2013: £129.3m restated); and NATS Services Limited reported a profit before tax of £23.3m (2013: £33.2m restated). NATS safely handled just under 2.2 million flights during the year (2013: 2.1 million), an increase of 1.7% on the previous year. Average delay per flight attributable to NATS was 5.5 seconds (2013: 1.4 seconds) which is about one-fifth of the average European delay per flight and was despite a ground communications failure on 7th December 2013 that resulted in delays to customers. NATS continued to enable significant savings in fuel and CO2 emissions for customers which, since 2006, the company has estimated to be worth c. £255m to customers. NATS continues to advise the work of the Airports Commission in its consideration of potential options for future airport capacity in south-east England. This includes early assessment of shortlisted options, including airspace considerations for new runways or airports, with a particular emphasis on operational and network feasibility and identifying key constraints. The accounts of NATS Holdings Limited and its subsidiaries were approved by the Board on 26 June 2014 and are subject to formal adoption by shareholders at the Annual General Meeting to be held on 31 July 2014. The accounts will be available at www.nats.co.uk/annualresults from 0700 on Friday 27 June, 2014. NATS Holdings Limited is the parent company of the NATS group. NATS Holdings Limited operates through a Private Public Partnership (PPP) and is owned by the UK Government (48.9%); The Airline Group Limited (41.9%); LHR Airports Limited (4.2%) and the NATS Employee Sharetrust Limited (5.0%). The Airline Group is a consortium including British Airways plc, Monarch Airlines Retirement Benefit Plan Limited, easyJet Airline Company Limited and USS Sherwood Limited, which purchased 49.9% of The Airline Group in March 2014. Nominal shareholdings in The Airline Group are retained by Deutsche Lufthansa AG, Thomson Airways Limited, Thomas Cook Airline Limited and Virgin Atlantic Airways Limited. NATS (En Route) plc (NERL) is the sole provider of air traffic control services for aircraft flying en route in UK airspace and the eastern part of the North Atlantic. It provides approach services to aircraft arriving at or departing from the major airports around London and air traffic control services to helicopters operating in the North Sea. NERL also has a long-term agreement to provide the military with engineering, surveillance and communications services. It is economically regulated by the Civil Aviation Authority (CAA) within the regulatory framework of the European Commission (EC) Single European Sky (SES) and operates under licence from the Secretary of State for Transport. It operates from two air traffic control centres, at Swanwick in Hampshire and Prestwick in Ayrshire. NERL reported a profit before tax of £133.9m (2013:£129.3m restated). NATS Services Limited provides air traffic services at most of the UK’s major airports, including Heathrow and Gatwick, the world’s busiest dual and single-runway airports. Some of its airport contracts are subject to economic regulatory oversight by the CAA and the EC. NATS Services also sells engineering, consultancy (including training), defence and aviation information management services to customers in the UK and overseas. 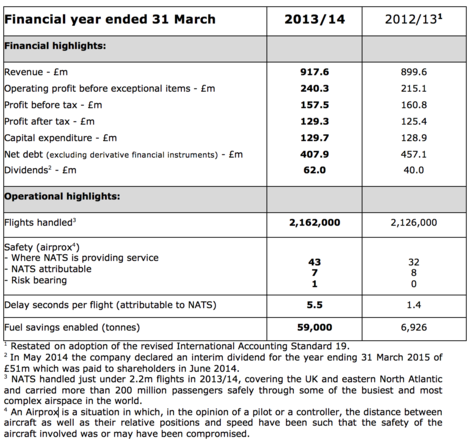 NATS Services reported a profit before tax of £23.3m (2013:£33.2m).